How Far is SG Durga Gardens? 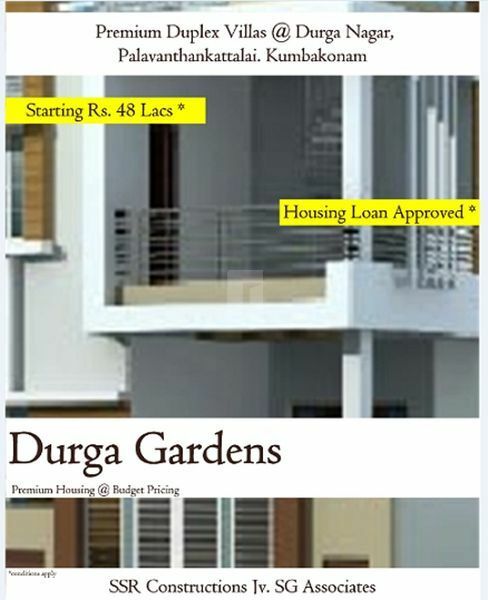 Durga Gardens, is a Premium Duplex residential project developed by SSRC Jv SG Associates at Durga Nagar, Kumbakonam, Tanjore Dist. Tamil nadu. The project offers well designed 2 & 3 BHK Duplex houses. The site is a posh locality and well connected by various modes of transportation and near civic utilities and temples. The site is very close to Sacred Heart Hospital and Indian Oil Petrol Bunk located in Kumbakonam- Thirunaageswaram Main road.